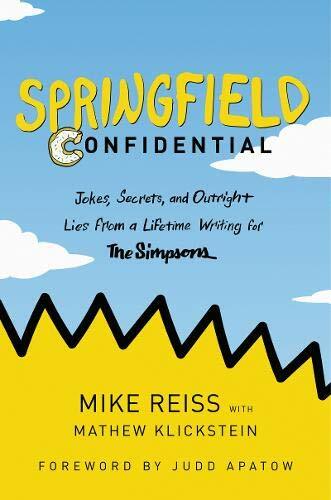 No matter, as he confides at the beginning of Springfield Confidential: Jokes, Secrets, and Outright Lies from a Lifetime Writing for The Simpsons, the first insider’s take on the long-running show. The unanimous view among the madcap young writers was that the show wouldn’t last more than six episodes, so they might as well have fun. If there is anyone who should know what’s behind the curtain of The Simpsons, America’s favorite family sitcom, it’s Reiss. He is one of the very few of the long-running show’s writers who was present at the series launch, in January of 1990, and who is still helping churn out episodes. Springfield Confidential is the latest in a seemingly neverending (but clearly waning) stream of books about the series. Reiss and co-author Mathew Klickstein have written it to mark the show’s 30th anniversary—and also airing its 636th episode, which makes it officially television’s longest running series, eclipsing Gunsmoke. Some of the show’s notoriously ardent and exacting fans may have some gripes: Reiss denigrates much of the academic interpretations of the series, and occasionally a little smugness bleeds through his prose. Although the show focuses on the family’s Protestant faith—the church sanctuary is one of the few places where nearly everyone gathers each Sunday—there is a section headed “Other Religions Are Funny Too.” The show has an ongoing interest in non-Christian faiths, and Reiss confirms the widely suspected explanation why it took so long for the writers to get to Islam: fear. Reiss, a four-time Emmy winner for his work on the show, and Klickstein have probably pulled a few sensitive punches along the way. On one controversy, Reiss makes the dubious claim that the show’s bosses never considered replacing the high-priced voice talent—“We’d never dream of replacing them with cheaper soundalikes.” This, despite numerous media reports to the contrary, based on Fox leaks during periodically contentious contract negotiations. The section on how each episode is constructed can be, as Reiss warns, a little draggy. Like sausage and legislation, the making of comedy may not be something you want to get too close to. In the case of The Simpsons, episode creation can resemble an industrial-scale, literary assembly line, lasting nearly a year. But Reiss is good on what it is like to be in a high-pressure writers' room. In this case, he says, the individual writers are temperamentally much more like Lisa than Bart. Ratings for new Sunday night, prime time, Simpsons episodes have been on a steady decline from the early years, when the show was consistently in the top ten, especially among men aged 18–34. (Although Season 29 experienced a modest ratings bump.) The show still airs in 71 countries, but is most popular in Latin America, where dialogue is dubbed in Spanish by a Mexican cast. In 2016, a Trump-themed animated Simpsons short got 12 million downloads on YouTube. Despite the ratings slump, the cartoon sitcom remains a potent, if sporadic cultural force. A 2018 a documentary entitled “The Problem with Apu,” sparked a debate in the airwaves, print, and social media about stereotypical portrayal of Springfield’s good-hearted convenience store manager. The conversation spilled over into the larger issue of the image of South Asian immigrants and their children in American popular culture. “When will The Simpsons end?” he follows. “The day people all over the world start treating each other with love, respect and intelligence . . .” Which is to say, probably never. Mark I. Pinsky is the author, most recently, of the ebook original The Gospel According to The Simpsons: A Newer Testament, a sequel to his best-selling The Gospel According to The Simpsons: The Spiritual Life of the World’s Most Animated Family.